We love Freshdesk. They have one of the most impressive remote marketing departments we’ve ever seen. So good in fact, that we actually left Zendesk which we had a long relationship with because they offered an easy way for us to transfer our customers over at half the cost and we really loved this photo they sent us. Just in case you’re not familiar with FreshDesk, FreshDesk is a cloud-based customer support platform that aims to make businesses communicate more efficiently with their customers, and vice versa. It has different app integrations that allow any business to communicate with their clients through any channel they prefer whether it be through website chat (Olark), email (Gmail, Mailchimp or one of their competitors, etc. ), or social media (Facebook, Twitter). FreshDesk can easily convert a message from one channel to a customer ticket which your employees can respond to. After we switched over to Freshdesk, we implemented a time tracking integration with Freshdesk which is used by thousands of our customers every single day. However, even though we think we’re awesome at solving all your time tracking needs we realize we’re not the perfect solution for everybody. 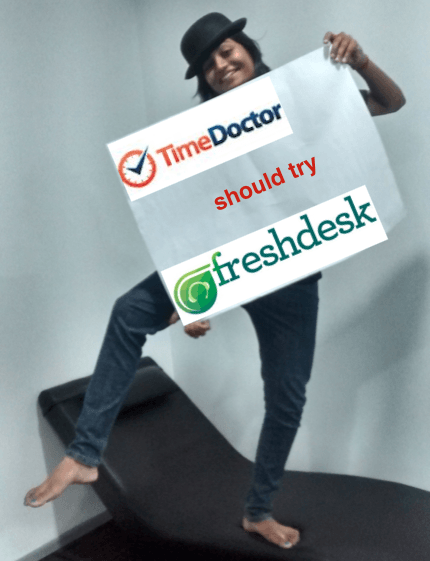 So, we thought we’d do a review of what we see as the best time tracking solutions for Freshdesk on the market and what each integration is specifically good at so you can make the best decision for your company. What it is: Of course I’m going to start with our company’s integration with Freshdesk! 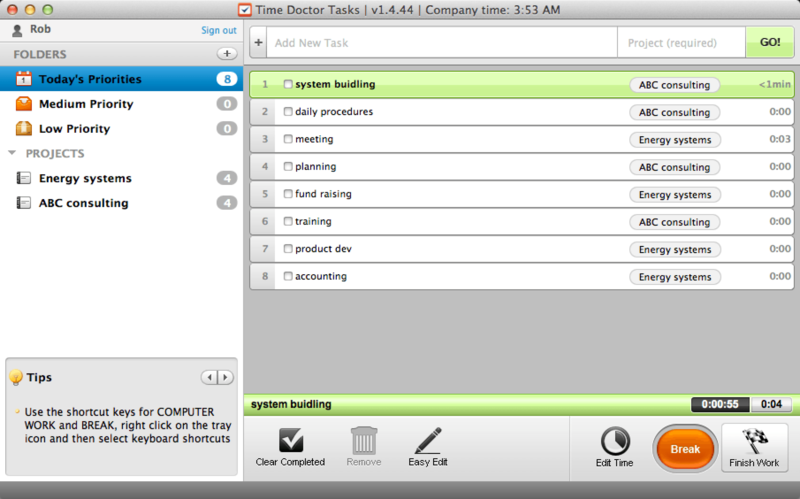 Time Doctor is a time analytics and time tracking software solution geared towards remote teams. Why it’s different: Unlike most time tracking solutions that simply track how much time you spend on a task, Time Doctor tracks how efficiently you have completed that task. It tracks the time you spend, the mouse movements, keyboard movements, websites and applications that you interact with and then gives you metrics on how efficiently you complete those tasks for yourself and your team. Who’s it for: Anybody who needs website and application tracking on top of simple time tracking and anybody who manages remote employees. It’s also a great solution for time tracking for agencies. 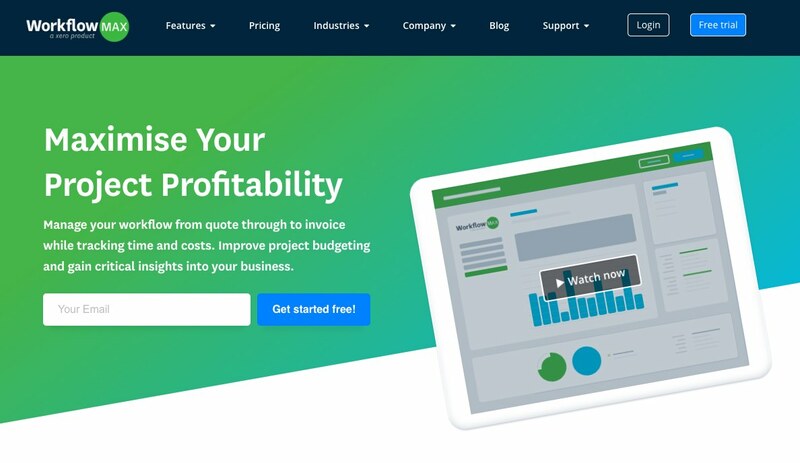 What it is: Freshbooks is a great Canadian (like me) invoicing and time tracking application that makes sending invoices for freelancers really easy. Why it’s different: Freshbooks was one of the first really easy invoicing apps on the market and they also differentiated themselves by being completely free. 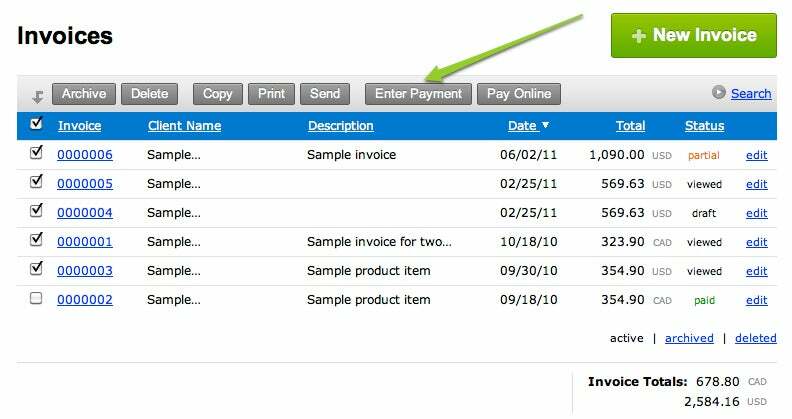 A lot of companies have followed their lead, but they are still one of the best freemium invoicing applications on the market. Their differentiator is their ease of use which allowed them to gain so much market share in the individual freelancer space. Who’s it for: I believe Freshbooks is probably the best tool on the market for individual freelancers. It’s incredibly easy to use and if you just want something that ‘works’ at the expense of more complex features, I would suggest you go with Freshbooks. What it is: BillLiving is an app designed to make billing clients ridiculously easy. It specifically allows you to push the amount of time you spend on Freshdesk tickets directly into BillLiving and then make invoices based off that time spent. Why it’s different: If you’re doing client work on a per hour basis, this would be a great app to use. You can easily track and invoice any freelance work for your company and since it’s integrated directly on your FreshDesk account, it comes in very convenient for you and your agent to extract time records spent for supporting clients. The good thing about Billiving is that you can sign up for FREE. If you have a very small client base (max 5), you can create unlimited invoices and estimates with this app. They have paid versions as well –Professional, Enterprise and Ultimate– which provides you with extra features and can help you track 100 to 500 and even unlimited clients. Who’s it for: Anybody that wants to track time through freshdesk and put it directly into an invoice. I would say it’s geared towards small teams and freelancers. What it is: Quickbooks is one of the largest accounting software packages on the market. The software allows you to manage expenses, payroll and other small business needs. It is arguably the most complex of the time tracking integrations with freshdesk but is also the most configurable. 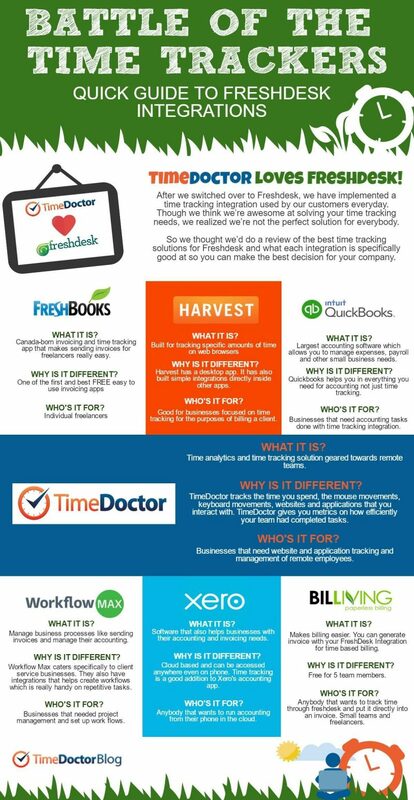 Who’s it for: Time tracking is only a small part of this fully featured accounting software. If you’re looking for a complete accounting solution for your company, Quickbooks is the perfect service for you. It has all the features you will need to run all accounting tasks in your business and the time tracking integration with freshdesk will just make it that much easier. Why it’s different: Harvest has built a lot of simple integrations directly inside of other apps. So unlike Time Doctor which has a desktop app, Harvest has buttons built inside of other apps where you can start and stop time. This is really fast and easy if you’re just looking to track how long you spent working on a particular ticket as an example. Who’s it for: Anybody that wants idiot proof, simple time tracking and isn’t interested in tracking your overall productivity. 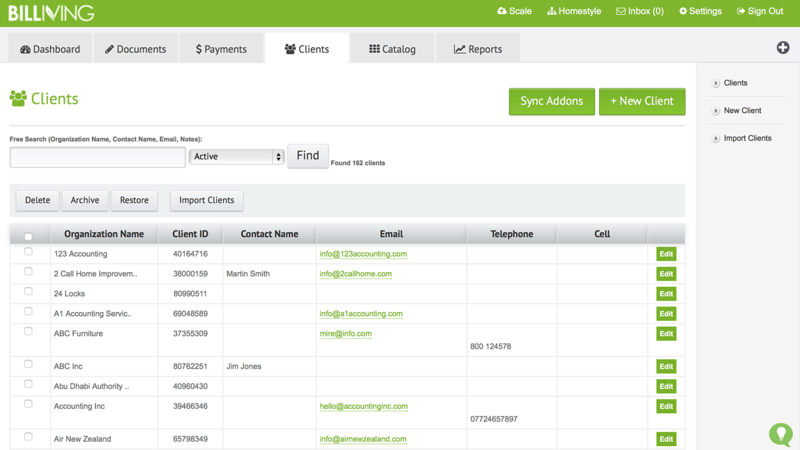 This is good for businesses focused on time tracking for the purposes of billing a client. What it is: WorkflowMax is workflow software for client service based companies such as engineering firms and marketing agencies. Customers of WorkflowMax are able to manage business processes such as sending invoices and manage their accounting. With time tracking software, WorkflowMax customers are able to bill their clients with the confidence that each client will be profitable. Why it’s different: Unlike other project management and time management tools, WorkflowMax caters specifically to client service businesses. It also has a LOT of integrations and allows you to create workflows for users which is really handy on repetitive tasks. Who’s it for: If you want to do project management and need to also set up work flows and systems then Workflowmax is the app for you. I would say based off testing that the time tracking component is quite simple in comparison to Time Doctor but is a great solution if you’re interested in just sticking with one app (we also integrate with WorkflowMax as well). What it is: Xero is the other larger accounting application in the market and has a lot of the functionality of quickbooks and focuses on really good integrations (like with freshdesk) and their mobile app to differentiate themselves in the market. Why it’s different: Xero is accounting for the 21st century. The integrations and mobile app allow you to really build a solid, cloud based, access anywhere, scale as much as you want, solution. Freshdesk time tracking much like WorkFlowMax isn’t as good as Time Doctor but if you’re only doing small time tracking tasks it’s a great solution since it’s part of the Xero product. Who’s it for: Anybody that wants to run accounting from their phone in the cloud. Have you tried any of these integrations? We would love to hear your feedback on what FreshDesk integration works best for your time tracking needs. Let us know in the comments below!